Woody Pop would be the final game to receive the Mark III packaging in Japan. Why am I so bad at Breakout clones, guys? I try to keep the ball bouncing from the paddle to the bricks, just like Woz taught me to. But once the ball starts jitterbuggin’ all over the screen, my eyes can’t keep track of the movement. They twitch and bleed, and the ball sinks into the abyss beneath the paddle, time and time again. Woody Pop is one of the more bizarre Breakout clones, in that, its story sounds like it emerged from a spec script of the Robin Williams movie, ‘Toys.’ The paddle you control is actually a log named Woody. He has eyes, a smile, rosy cheeks and what appears to be some semblance of a soul (Woody winces in pain when the ball drops into the black chasm below him). Woody’s not just bouncing balls against bricks because he’s a masochist seeking new forms of pain. He’s rebelling against the Mad Machine for shutting down the Enchanted Mansion toy factory and using it for his obsessive-compulsive need to re-arrange bricks. I’m not sure what the story has to do with anything, other than an excuse to make a simplistic ball-and-paddle game. But the fact that you’re able to play as a smiling wooden paddle means we’re one step closer to controlling oddities like Kid Chameleon and Toe Jam and Earl. The future is soon, folks. Doesn’t Woody look like he’s up to something? Maybe he’s the villain in disguise. Each of the rooms has bricks laid out in the shape of something, whether it be a sword, a helicopter, a boat, etc. The colored bricks take one hit to destroy; wood bricks (?!) 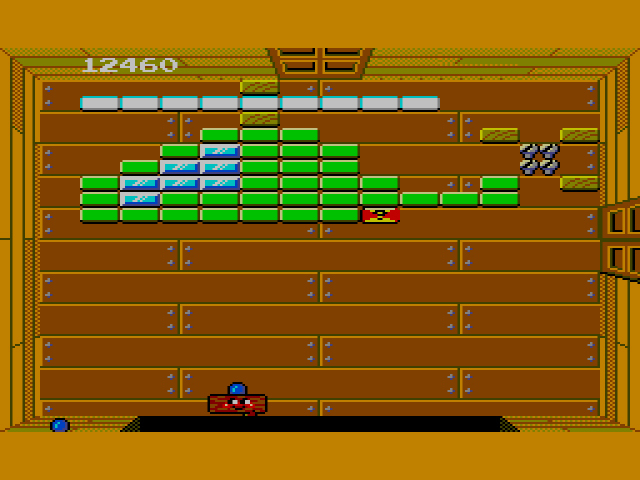 take several hits unless you have a flaming ball; and shiny blue bricks which, once hit, drop power-ups. The power-ups enhance either Woody or the ball, giving you potential advantages in clearing away the bricks. If you’ve ever played Arkanoid or Breakout, you’ll recognize some of them: flaming balls clear away wooden bricks in one shot; red batteries enlarge the ball for greater destruction; two balls allows there to be, yes, two balls careening across the environment. Once the room is cleared of bricks, Woody moves on to the next room – unless there are multiple exits. If the room has several doors, you have the ability to choose your path. This makes Woody Pop the first and perhaps only non-linear ball-and-paddle game. The door on the right looks mighty tempting. Unfortunately, Woody Pop “requires” Sega’s Paddle Control to work properly. If you’re trying to play Woody Pop for the Mark III, you won’t be able to use it without the Paddle Control. If, however, you’re using other more questionable methods, there are ways around this ridiculous necessity. “Configurations,” if you will. And if you’ll oblige me a rant for a moment, I’ve never understood why companies make games that can only be used with certain controls. Money would seem to be the obvious answer, but that doesn’t make good business sense. Business sense dictates that you want to reach as many people as possible with your product. But Woody Pop, Great Ice Hockey, and other Sega games like them that require additional peripherals go against said sense. Sure, if someone really wants to play Woody Pop or Galactic Protector, they’ll shell out the extra 1,200 yen for the Paddle Control. But if the consumer is only kinda interested in the game, they’re going to walk away once they realize the game requires a separate controller. My opinion: peripherals should always be optional, not required. They should enhance the game they’re designed for, nothing more. The Paddle Control looks decent enough, I suppose. The control is only a little wider than a standard Mark III controller, and that’s because the paddle on the left hand side is slightly wider than the directional pad. Thankfully, Sega didn’t see the need to completely reverse the controller layout like they did with the Sports Pad. Not sure why they separated the two buttons. Placing one button on the top of the controller is a confusing move when there seems to be plenty of space on the front for the two main buttons to rest side by side. But you probably won’t be playing many two-button games with the Paddle Control anyway, so perhaps Sega wanted to just move the button out of the way. I am bad at Woody Pop, no doubt about that. 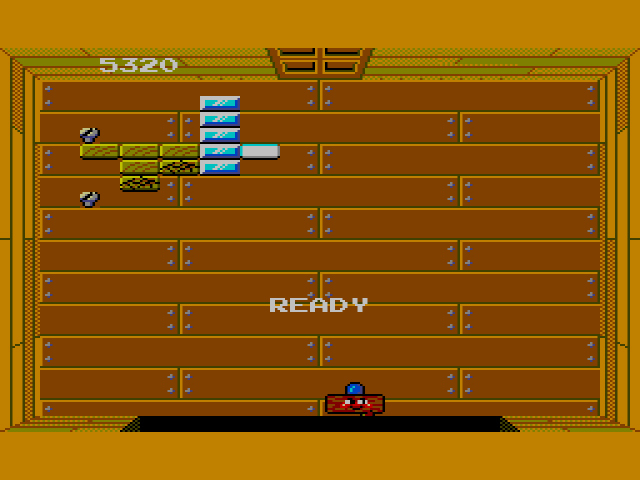 I couldn’t get past the fourth level to save my life (or Woody’s life – I hate seeing a happy-go-lucky log wince). Perhaps my pain would have been eased somewhat with the Paddle Control in my hands, but even with my own configurations, I felt the controls worked well. I think the real culprit here is aging. 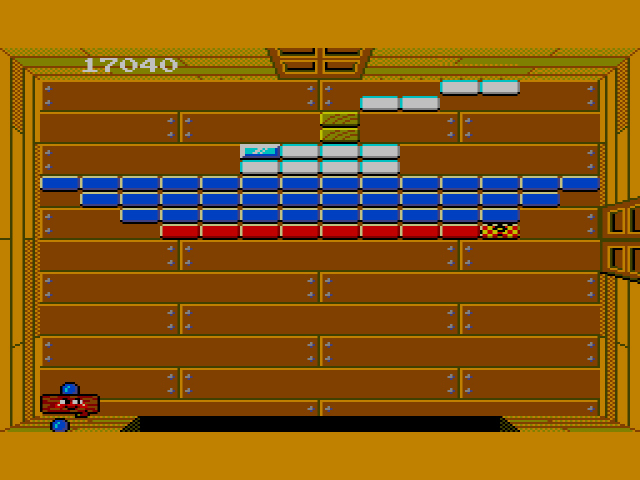 I’m not old by any means, but my hand/eye co-ordination has never been great for ball-and-paddle games, and it’s only gotten worse since I reviewed Arkanoid for the NES lo some four years ago. If you thrive on the tension and speed found in the limited ball-and-paddle genre, give Woody Pop a go. But if you’re like me, leave Woody’s misadventures in the Enchanted Mansion toy factory to the young and spry. I knew the NES had a plethora of peripherals thanks largely to the AVGN’s video series but I never knew the SMS/Mark III had so many as well. Was the paddle controller available on the SMS? Just the Mark III, thankfully. Yup I imagine at one time Sega planned to release this hear as it was in the older game catalogs for coming soon games. Just seeing the name Woody Pop got me excited about what type of game this could be. Sadly (or not) they never did release it here for the SMS. Maybe they didn’t want to release the controller? (Although 3-D made the cut.) great review. Despite the dubious 3 grades, I actually know where you are coming from on this. I wonder if a trackball mouse could be used on this on your “Machine” kind of like you can use a trackball mouse on Marble Madness in MAME. I’m not surprised that Sega had planned this for release outside Japan at one point. And they could have done it too, if not for the stupid Paddle Control (I assume). Good point on the trackball mouse, though my standard controller worked just fine. Im kind of undecided of undecided if I would have actually bought this or not. I know I would never have bought the trackball controller, just to play Hockey which is a sport I do not like, or Football. But I did have various other peripherals for the machine I did but they were a lot more useful across different types of games. A paddle controller seems kind of like I wouldn’t have got my money out of it. Kind of like the Arkanoid controller. I am curious though, since the Atari 2600 uses the same joystick controller plug as the SMS and Genesis, and the controllers were somewhat compatible, if I could have used my Atari 2600 paddle controller on this? Even though it had only one button. I Definetly remember using my Atari 2600 flight stick style joystick for Space Harrier. I have a Sega Genesis flash cart that plays SMS games. I should loaf up the ROM and and try it out with the Atari paddle. I love the different grades for your moods and whatnot…brilliant. Multiple grades are a bit ridiculous, but they’re certainly honest. if this was released in the US, Beavis and Butthead would probably play it at Stewart’s house and end up bitterly disappointed. Crazy that your arkanoid review was four years ago!!! Woody Pop was featured on the “Take Hold Of Sega Adventure” poster which was inserted into Master System games in and around 1987 (it was listed as a Sega Card game). It specifically calls out that the Paddle Controller is required to play, so I am assuming that there were plans to release it here in the US, but they fell through. If I am remembering correctly. 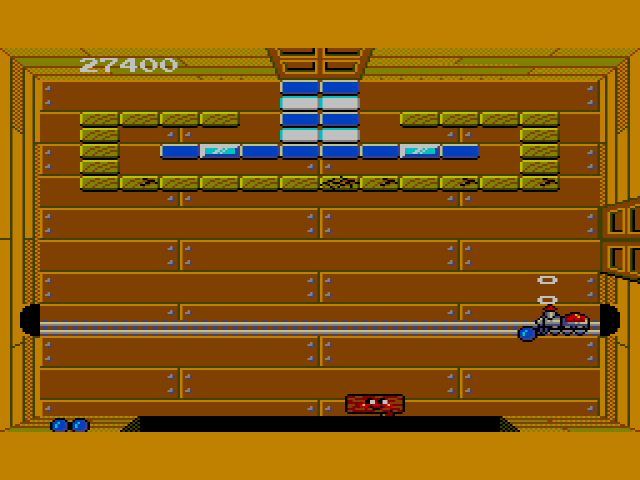 there were a handful of other games which required the paddle controller (Alex Kidd’s BMX is the only one I can remember), and some which could use the paddle but were not required, namely OutRun and OutRun 3D. I would assume that Hang-On would be a good fit for the paddle controller as well? Of course, I do have to wonder how the heck you downshift and upshift in OutRun without being able to press Up or Down? I have come to really like brick breakering (kuzushi) games as I have gotten older, so Woody Pop always has a spot on my Game Gear. But even then it can be pretty tough to play with the digital D-Pad.